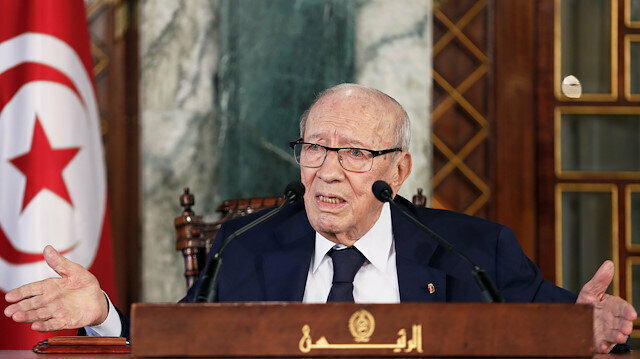 Tunisian President Beji Caid Essebsi on Tuesday extended the country’s state of emergency for another month.The extension takes effect from Wednesday until Dec. 6, according to a statement issued by his office.The statement said the decision came following consultations between Essebsi, Prime Minister Youssef Chahed and Parliament Speaker Mohammad al-Nasser.Last week, a woman blew herself up in capital Tunis, killing herself and injuring around 20 people.Cabinet reshuffle displeases Tunisian presidentThe state of emergency was first imposed following Tunisia’s popular uprising in late 2010/early 2011, which ended the regime of autocratic President Zine El Abidine Ben Ali after almost 25 years in power.A second state of emergency was imposed in late 2015 after a terrorist attack in Tunis left dozens dead, including security personnel.Renewed several times since, the state of emergency endows the interior minister with exceptional powers, including the imposition of curfews and media censorship without judicial approval. Chahed leads a government dominated by the ruling Nidaa Tounes party. A cabinet reshuffle announced by Prime Minister Youssef Chahed has displeased Tunisian President Beji Caid Essebsi, according to a presidential spokeswoman.“President Essebsi disapproves the cabinet reshuffle,” Saida Garrach told the local Mosaique radio station late Monday.She described Chahed’s announcement of the reshuffle as “hasty and a kind of a fait-accompli policy”.“The president was not consulted about the reshuffle and was informed very late about the move,” the spokeswoman said.On Monday, Chahed named 13 new ministers in a cabinet reshuffle he hopes will help boost the country’s troubled economy.The reshuffle included the appointment of Jewish businessman Rene Trabelsi as a tourism minister. "This reshuffle is to make the work of government more effective and to put an end to the political and economic crisis," Chahed said in a statement.He said the reshuffle was part of the powers granted to him by the Tunisian Constitution.Chahed’s government has been under fire in recent months over worsening economic conditions in the country amid calls for the prime minister to resign.In July, Essebsi called on Chahed to quit or seek a confidence vote if the country's political and economic crisis continues.In May, Essebsi’s son, Hafedh Caid Essebsi, who is leader of the ruling Nidaa Tounes party, called for Chahed’s dismissal, saying his government “does not represent his party”.Chahed was appointed as prime minister by Essebsi in 2016.